Montecito’s Casa del Herrero Foundation was one of 27 Honorees at the 2010 Community Support Breakfast given by Wells Fargo Bank. Casa Executive Director Molly Barker accepted the cash award of $1,000 on behalf of the Casa del Herrero, the non-profit foundation that operates the historic house and gardens. 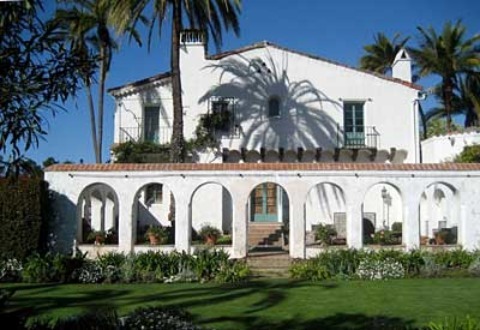 A little known Santa Barbara cultural treasure, the Casa last year was designated the fourth National Historic Landmark site within the city of Santa Barbara. Other City of Santa Barbara NHL sites include the SB County Courthouse, the Mission Santa Barbara, and the Rafael Gonzales House. •	Tours (by advance reservation) available Wednesdays & Saturdays at 10:00 am & 2:00 pm. •	The Casa del Herrero is open mid-February through mid-November for tours. • Six days of December Holiday Tours, when the Casa is decorated for Christmas season, will be offered Wednesdays, Fridays, and Saturdays, December 8th through December 18th. •	For reservations and information, please call 805-565-5653, ex. 202.